Clearly, whoever wrote this movie knew their stuff. They didn’t just pick any random weed for their flick but one that really has a tonne of good qualities. Pineapple Express is the cross of two extraordinary strains: the legendary OG Kush and a tropical, particular fruity Jamaican Pineapple. Thanks to her excellent genetics, Pineapple Express shines with substantial growing vigour that shows in her very short flowering time of only 55 days and yields of up to 550g/m² when you grow her indoors. Likewise, the plant keeps at a convenient height of about 100-130cm. Outdoors, she will grow somewhat taller and can reach 120-170cm with yields of up to 500g per plant in good conditions. Her medium height makes Pineapple Express a good plant to grow in tents or greenhouses and makes her especially well-suited for guerilla grows because she has just the right balance between yields and visibility. Given her tropical fruity Jamaican parent and the citrus aromas from the OG, smoking Pineapple Express is nothing short of an incredible experience that can make it difficult to pass a blunt or lay it down once you got your first hit. Her superb mix of tropical pineapple flavours is perfectly accentuated with the lovely, subtly tangy and refreshing lemon notes from the OG. With 19% of THC and thanks to excellent genetics including those from the legendary OG Kush, Pineapple Express doesn’t just taste awesome but sure isn’t a light-weight when it comes to her effect either. She’s potent and delivers a strong, heavy-hitting indica effect that’s incredibly relaxing, if not outright narcotic. But with this deep relaxation comes also a nice happy feeling. A remarkable, highly enjoyable smoke that you can enjoy all day long! 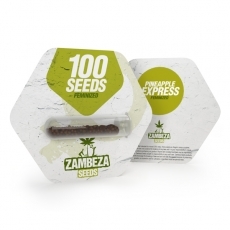 Pineapple Express by Zambeza is a superb indica strain that will please pretty much anyone, from the cannabis connoisseurs who are always looking for outstanding flavours to the smokers who want the perfect smoke for chilling and relaxation. Growers who require more seeds can get Pineapple Express bulk seeds at Zambeza in packs of 100 seeds.